Blog developed for an eCommerce class. Introduces myself to the class. This what your Pieces of Me Blog Ad will look like to visitors! Of course you will want to use keywords and ad targeting to get the most out of your ad campaign! So purchase an ad space today before there all gone! Finished “Into the Wild” by Jon Krakauer. It took me a minute to get into it. It is a very short read. By the end I was truly fascinated by how much Chris McCandless captivated the writer. The scientist in me (although not very big) loved the testing of all the theories of what truly caused Chris’s death. I was moved by those who came in contact with Chris and how quickly a bond was formed in such short time frames. Good non-fiction read! I have added some of Krakauer’s other books onto my to read shelf of GoodReads. Chandler – Just turned 20. Working as an electrician apprentice. Loves baseball! Kyler – Music fanatic! Graduating high school this year. Getting ready to start adult life. Mikaylee – Dancing is her passion. She plays the viola and is learning guitar. Getting her driver’s license this year. Mylee – Cheerleader and goofball. Loves singing and tumbling. She likes dogs more than people :). My name is Holly Andrews. Currently I live in Riverton, a suburb of Salt Lake City. I have been employed with Intermountain Healthcare for the last four years. Intermountain employs over 38,000 individuals and has around 4,000 volunteers. This grows every year. I work under the Director of Employee Health, a discipline also known as occupational health. I love going to work everyday and am good at what I do. My portfolio of duties include managing the Employee Health Screening Clinic. We perform drug screens on new employee candidates and volunteers. We screen all immunization records of these individuals to make sure that they meet our requirements and are in line with the Center of Disease Control’s (CDC) recommendations for healthcare workers. Part of my responsibilities are to manage all the drug screen results for the company. This includes being certified as the Designated Employee Representative (DER) for the Department of Transportation (DOT) drug and alcohol program which is mandated for all of our FAA Life Flight pilots and FMCSA drivers. As well as being the go-to-person for our system Employee Health staff, I manage our in-house databases. This involves working with the programmers to develop, update, and troubleshoot these programs. Our department has an internal website which is maintained and managed by me along with direction from our eBusiness group. I work with our Compliance team, Medical Directors, Employee Health Director, and other stakeholders to update and create forms, documents, policies, procedures, and guidelines. The diversity of duties and individuals I get to work with make my job fun and fulfilling! I have been in school longer than I have ever been out. My road to higher education ended up with many twists and turns, not the straight path I anticipated. The paths taken have been painful, exciting, challenging, and long, but very fulfilling. I always wanted to go to college. I wanted to be a prosecuting attorney in criminal law, or a mermaid, but the fins never manifested themselves. Instead of pursuing this goal after graduating high school, I chose the easy path of starting a family (insert sarcasm). When I finally decided it was time to get going on that undergraduate degree, I decided that law school was no longer my passion. I did keep the criminal aspect though….I wanted to be in forensics. I graduated with an Associate of Science in Criminal Justice from Salt Lake Community College. I was then informed that I needed to get a science degree to work at the Utah State Crime Lab. What? I didn’t do any of those classes for my associate degree…..I had to do several math and science prerequisites and then I was ready to work on getting my bachelor’s degree in biology. Life throws curve balls at you sometimes. I was working at the Utah Bureau of Criminal Identification at this point. My work life and family life made it almost impossible to complete my biology degree. I was so close…but swung a strike again. I had to make a decision….quit school altogether or find a degree that I could fit into my current life situation. I graduated 11 1/2 years from the start of the journey with a Bachelor of Science in Business Management from the University of Utah….finally a home run! I have been out of school for three years and am ready for the next step in my education saga. I enjoy meeting interesting people and learning from their diversity and different points of view. People are fascinating. Higher education gives us a great opportunity to learn about so many different places and people through our interactions. I am looking forward to finding out what is going to happen next! 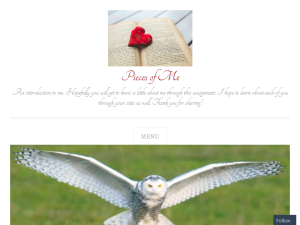 If you are the owner of Pieces of Me, or someone who enjoys this blog why not upgrade it to a Featured Listing or Permanent Listing?